My husband comes home for lunch everyday so I always try to come up with something different. Usually, it has to be something simple and fast enough as my mornings seem to fly past me. Sometimes, I combine recipes that I believe go well together and in my opinion they did in this case. The freshness of the salad was exactly what I was looking for. The balance between the sweetness of the pear, the nutty flavour of the hazelnuts and then the vinaigrette’s sweetness with just enough acidity, tasted great. The soup was comforting and had just the right amount of spiciness given by the chiles Poblanos. Poblanos are by the way, my favourite chiles! I usually cook them on the gas stove top. I put them directly on the flame of one of the burners and roast them thoroughly, turning them often. 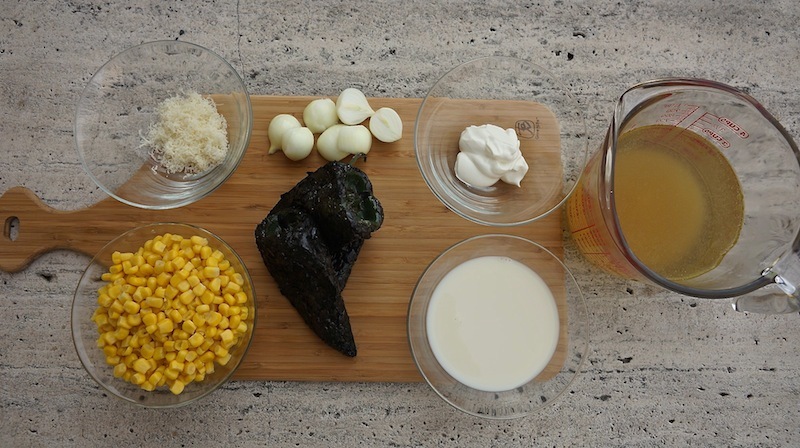 If there was a smell that would define Mexico for me then it would be the roasted smell of the poblanos, I love it when it spreads all over the kitchen! I then put them in a plastic bag for at least 10 minutes. Finally, with my fingers or with a paper towel I peel off the skin, make a cut on the side and scrape out the seeds and veins. They are then ready to use in any type of recipe. 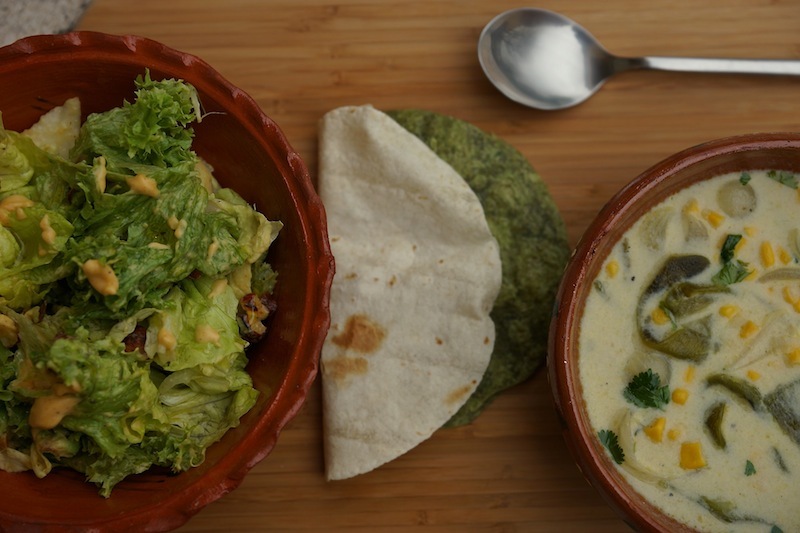 Both recipes were adapted from one of my favourite Mexican chefs, Oropeza. Besides having very creative recipes, he is very health oriented, which reflects in the ingredients and methods he uses. Vinaigrette: Blend all the ingredients until you reach a soft and smooth consistency. Salad : Toast the hazelnuts in a dry skillet for a few minutes. In a bowl combine the lettuce leaves, the shallot and half of the vinaigrette. Toss well, you want the lettuce to get as much flavour as possible Add the pears and the avocado slices and sprinkle the hazelnuts on top. Serve in small bowls and spread a bit more of the vinaigrette on top. Wash and dry well the chiles poblanos. Flame-roast them directly on one of your gas stove burners, turning them often until the surface is blistered and blackened. This, as I explained, is my favourite method. However, you can also roast them by brushing them in vegetable oil, and putting them in a baking sheet very near a pre-heated broiler which can take from 4 to 8 minutes. You can also use about an inch of very hot oil and fry them in a pan until blackened. When they have changed colour put them in a plastic bag and close it for 10 minutes, the steam will help loosen the skin easier. While you wait, cut the spring onions in half, using also the green part. Then take the Poblano chiles out and with your fingers, a kitchen towel or a small spoon, remove the burned skin. Cut them in half, lengthwise, and scrape the seeds and white veins out. Then slice them in strips. In a pan heat 1 tbsp of canola oil for 1 minute. Add all the vegetables and cook for 6 minutes until golden. Stir often. Add the chicken stock and bring it to a boil over medium heat. Cover it and let it cook for 5 minutes. Stir in the milk, cheese and the seasoning until well combined. Cook for another 2 minutes over high heat. Serve hot, garnished with the fresh cilantro and a bit of olive oil. To accompany the salad and soup we had flour and nopal flavoured tortillas.